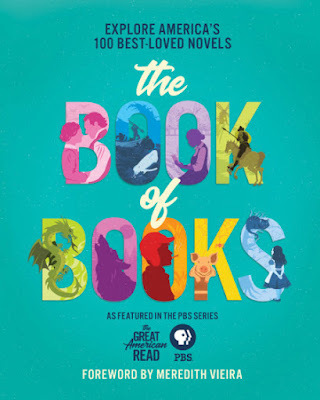 Explore some of the most beloved books of all-time in the beautiful illustrated book, The Great American Read: The Book of Books, the companion to PBS’s ambitious series. The Great American Read started in May when America’s 100 best-loved novels, which were determined by a rigorous national survey, were revealed. Celebrities and everyday Americans will champion their favorite novels every Tuesday night on PBS up until the finale in late October, when America’s #1 best-loved novel will be revealed. The Great American Read: The Book of Books presents all 100 novels with fascinating information about each book, author profiles, a snapshot of the novel’s social relevance, film or television adaptations, other books and writings by the author, and little-known facts. Also included are themed articles about banned books, the most influential book illustrators, reading recommendations, the best first-lines in literature, and more. Meredith Vieira, the host of The Great American Read, wrote the foreword to The Book of Books. "There are few things as satisfying and as long lasting as a beloved book, writes Vieira. "My favorite books have become the touchstones in my life; I remember where I was when they found me, why they spoke to me at that particular time, and how I'd often passionately recommend them to my friends. Many of my favorites still sit on my bookshelves as a reminder of the wonderful experiences they've brought to me. In quiet moments, I pull them from the shelves and revisit them like old friends. "With The Great American Read, PBS has set out to unite America around one powerful idea: What if we could forget for a moment all of the things that divide us and remember the ideas, the characters, the stories that make up our common thread? What if by celebrating our favorite books together, and by learning the unique history behind them, we could rediscover the joy the finest storytellers have brought us?" The Great American Read: The Book of Books is a beautiful, extensively-researched production that will be appreciated by all booklovers. The Wheel of Time** - James Oliver Rigney, Jr.